7.77 points at 26 votes (rank 135). 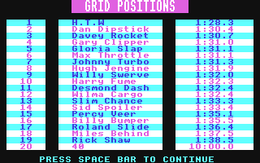 Revs and Revs+ are probably the only motor sport racing simulations on the C64, that take into account the many parameters of handling and other limit areas, also tyres. 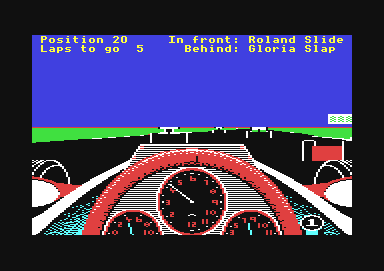 The graphics are limited to only few gimmicks except for the realistic display of the cockpit. The landscape is green, in front of the curves a sign shows the direction and angle of the curve. Otherwise, there is not much to see. The opponent's Formel 3 vehicles are rather fluently animated and well recognizable. The red, small flags at each top of the curve are fantastic. So it is easy to drive the ideal line even with unclear or sloping curves. One weakness seems to be the sound, as it is only limited to your own car and sounds rather monotonuous. Opposing cars are on the other hand well recognizably shown in the rear mirror (variable distance). For the other functions see "1) Keyboard only"
It is possible to drive with the digital joystick only, without the rotary knob. For this the computer-aided steering C= + C must be switched on!! The steering is now additionally done with the joystick (not with the rotary knob). If you steer while accelerating or instantly accelerate after steering, the steering wheel is held in the position where it currently is. If you do not accelerate, the steering wheel will turn back to the neutral position after steering - this corresponds to letting go of the steering wheel. The steering wheel follows the position of the stick. Gas and brakes follow the position of the stick. Press the key T , when the car is in idle speed or ungeared ( Q / CTRL or / ) until the motor gets running. A more detailed description at "Aerodynamics of the car". The biggest action of force is between 5000 and 5800 rpm. From this follows that you should change the gears so that you always drive in this area of revolution speed. The simulated machine is, however, a bit more tolerant towards abuse than the real machine. This is for improving control over the car when using the keyboard or a digital joystick. Switching on and off is done by pressing the keys C= and C at the same time. A symbol appears on the rev meter when the function is active. The function should only be chosen with mode F1 or F5 . The function does not change the characteristics of the simulator, but is like an additional hand on the steering wheel. So it is still your task to determine the speed and correctly approach a curve. If no steering key is pressed or the joystick is in a neutral position, the steering wheel is automatically in middle position. If the car skidds and points opposite to the driving direction the computer-aided steering is switched off until the car points into the right direction again. SHIFT-LOCK locked: a linear reaction that corresponds to a real steering wheel. SHIFT-LOCK unlocked: a non-linear reaction that has the effect that the steering does not react so sensitively when driving straight. When loading the game you can choose between as many training laps as you like or a lap with stopped time that decides your position in the starting field. Before you are allowed on the track, you need to set the inclination of the front and rear spoliers. It is advisable to start with a heaviliy inclined rear spoiler and a not so much inclined front spoiler. You can return to the boxes any time and readjust the spoilers, provided the car has stopped by pressing the keys C= / ← (Commodore+arrow left). In training and qualification laps you start some distance in front of the starter's flag. The timekeeping will only start when you have passed the starter's flag. The revolution speed slows down when you get onto the grass strip with one wheel. If you are completely on the green, it is as if you are driving on ice. Stay in a high gear, do not brake! Only make careful steering movements. If the car is standing on the green stripe, switch to 3rd or 4th gear and start with depressed coupling. Starting in one of these gears avoids the wheelspin. If you reach a time within the requirements of 1min 40sec, press the keys C= / INST to enroll for a race. However, there are gradiations in the qualification time for the Amateur and Professional class. So you will not be allowed to drive in a higher class if you do not have reached the necessary minimum time for the qualification (1min40sec). Everyone can take part in the Novice class. The reason is that, in contrast to the Professional or Amateur class, there will be help even in the worst crashes. Special assistants get the cars into the correct position again. But do not expect that your car will always stay undamaged and remember not to start the car when a gear is in and the coupling is not depressed. After choosing the racing class and you have decided how long the qualification run should last, you are asked to enter the driver's name. Press the key RETURN and you find yourself in the pit to adjust the spoiler. You can prematurely abort the qualification run by pressing C= / 7 . You get an additional point for the fastest lap time. It is possible to drive a race with several players. 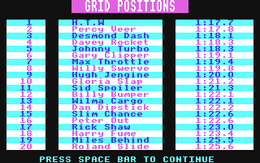 This works by each player trying to qualify whereby the drivers drive one after the other. The computer determines the driving abilities on the basis of the qualification round and simulates them, because only one player can drive a race at the time. The simple use of the point system ensures a fair result. 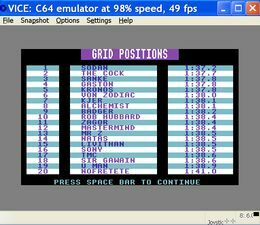 The system is thus modified so that the actual race of the player makes 50% of the reachable points. After the race, the 3 results boards appear and show you the final position and points, the best laps and sum of all points. When you have registered for a race, the Novice class or the class you have qualified for is confirmed and you see the table with the starting position which result from the lap times of the drivers. Next, you go to the pit to adjust the spoiler and then to the starting position. At the upper border of the screen important information are shown. These are: your position in the field, the number of rounds still to be done, which driver is in front or directly behind you. Start the engines. Do not try to drive yet, or the engine will die off. Look at the starting lights. At the start they alight in blue, then green. Now bring your engine to the necessary rev speed and try to get out of the throng as quickly as possible. Many race drivers know that there is a point near the 5000 rpm when the tyres overrun for a short time and the raise the accelaration. Precise coordination of braking and changing gear is of highest importance. Make the most of the speed that you have built up in the straights by braking at the last possible moment. At the same time, braking too late is absolutely suicidal. Braking makes the weight of the car move to the front axis and when you drive into a curve, the car skidds over the front axis. Keep in mind the markers for braking and changing gear, for steering and the summit of the curves. There are three markers in 100 meter intervals in front of each curve and another one at their summit. Always remember that accelerating takes twice as long as braking. The main purpose of the aerodynamic shaping of the RT3 is not only to let the air flow past as smoothly as possible, but also to raise road adhesion and by this the control over the car. In this simulation the rear and front spoiler can be adjusted in an area of 0-40, whereby this area corresponds to a movement of the spoiler of 10 degrees. The setting 40 makes the most down force. A strong incline of the spoiler helps to get good curve properties but a lower speed on the straight. Find the best compromise on every track. Overtaking is most of the time done in the curves. Try to get out of a curve faster than the car in front of you and then close the gap on it on the straight. Try to get next to the opponent's car in front of the braking area and steer into the curve on the inner track. But be careful: If you brake too late you will be carried too far out of the curve at the end of it. From a beginners point of view each curve is a death trap and seems to require accelerating, braking and changing gear in a split of a second. First you need to decide which line to follow best. There is a big difference between the line that you would take on a normal street and the one with which you approach a curve on a racing track, where the speed is often more than 100 MPH. The problem in each curve is to put the foot as early as possible on the fuel pedal and gear up. Always remember that accelerating takes twice as long as braking. On the ideal line it is most important to accelerate as much as security allows and always remember that the rev needs to be kept between 5000 and 5800. When you approach in 5th gear, braking is rather difficult because you need to stay at the left of the track and should drive a straight line so that you can keep up the balance of the car for precise driving. The moment of steering itself must be found out through experience and experimenting, as you can neither see the summit nor the end of the curve. Switch to 4th gear while you brake and quickly accelerate again to have a good emerging speed to get up the hill into the direction of the turning "Druids". If you make it to get out of "Paddock" with 5500 RPM or more in the 4th gear, then you have done a good job. Another difficult turning that needs much practice. Remember that the course of curve cannot be seen, that emerging speed is more important than the entering speed and that a too high loss of revs ruins your emerging speed. Approach in 4th gear at approx. 6000 RPM - do not brake too late - and quickly switch to the 2nd. The possibility of "Power Steering" (fast steering) was built into the REVS joystick controls for this curve and you will also need it to manage the curve. Try to keep up the moment of inertia by quasi driving into the curve in idle running, driving half through it and from the marker of the summit softly accelerating again. Then go on full throttle shortly before you have aligned it again for the end of the curve. Keep at the right when you drive out of it so that you are prepared for the coming left curve "Graham Hill Bend". This curve is rather uncomplicated for a Formel 3 car and can simply just be taken if you keep to the right line. Use the third gear or maybe even the 4th when you emerge from "Druids" well. Go early into the curve and use the spacious track at the end to keep the rev loss that arises when driving through the curve as low as possible. Switch up the the 5th gear until you brake for the next left curve. Another difficult curve for late braking because it gets narrower in the course (similar to "Paddock"). Try to drive in straight and brake softly. Use the 3rd gear and steer very late while you accelerate carefully and constantly to ensure a quick drive out of the curve. As the curve is followed by a straight, you will need as much speed as possible. Try to pass the exit marker with 6000 RPM in the 3rd gear. Then quickly change to 4th and 5th gear to drive the straight as fast as possible but also use the possibility to relax a bit before the "Hawthorns Bend". A challenging curve but when the car is correctly aligned you should make it in the 5th gear. (Use the 4th gear if you just get to know the track). Steer very late as the exit marker only appears when you have reached the curve's summit. A relatively easy-looking curve for the 4th gear but one that is hard to take correctly. Brake carefully, switch to 4th gear and drive a far curve in the late summit while you stand firmly on the gas pedal. If you did it correctly you are already in the 5th gear again as soon as you are through the curve. You have to brake slightly before you change to 4th gear and steer early to use to full width of the track at the end of the curve. This sounds easy, but it is not because you cannot see anything of the curve until you are there. After the end keep to the right and prepare for "Stirlings", stay in 4th gear. Brake Hard and switch to 3rd gear, steer heavily and push the gas pedal well as early as you can. A good passage makes approx. 5700 RPM at the end of the curve. Constancy is very important here to get well over the start/finish line. So try to keep the moment of inertia by not braking too hard while you switch into 4th gear. Steer early and do not miss the summit as you will otherwise inevitably get off the track at the end of the curve. Try to reach the exit mark in 4th gear with approx. 5800 RPM and then take the 5th gear for the section to the "Paddock Bend". "Riches" is approached in 5th gear and (depending on the spoiler settings) can be taken flat or almost flat. It is one curve with two summits and therefore it is important that the first one is approached well, so the rest of the curve can be done easily. 5400 RPM at the end of the curve is a good guideline. Here you need to brake hard and switch down to the 2nd gear. This right-angled curve leads to a very important straight. Do not let the rev drop too much in the curve and try to reach 5700 RPM in the 2nd gear when exiting the curve. There are two different methods of approaching in the first part of "The Esses" and it seems to be a question of personal preference of the drivers which to choose. The first method is, to brake, switch down to 3rd gear while staying on the right side of the track, then accelerate and drive on a normal line to the left summit and steer from the left side into the second part of the curve. 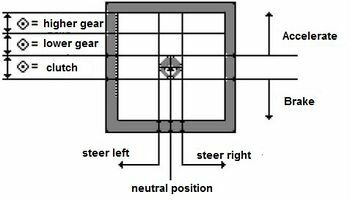 The alternative is, to drive normally on the right side, then steer diagonally to the left over the track aiming directly for the summit in which the gear box (2nd gear) is used for braking. From the summit accelerate shortly before you cautiously brake for the entrance into the second part. Experiment with both techniques to find out which one is faster and more comfortable for you. The second part of "The Esses" must be taken in 2nd gear. It is the most important curve on this track, because after that a long straight follows, almost one mile long and each second that you win here you will keep for over a half of the course so that the lap time improves enormously. Watch out that you get through smoothly and accelerate early. Do not let the revs drop too much anywhere, or otherwise a good lap time is not possible. Approx. 5500 RPM give an orientation for a good emerging speed. A rather simple curve, that should be driven through in 3rd gear without any problems. Steer hard and hit the summit, then there should be no difficulties. A long, flat right curve in which you should try to switch to 5th gear. Drive a smooth line so that you do not lose rev speed. If the tyres scrape heavily, this is a safe sign that you do not drive through smoothly enough. One of the most challenging curves. It is approached downhill with quickly rising revs in 5th gear and it is absolutely necessary to drive through it flatly. Try not to make any jerky movements when steering - keeping calm here is everything and a good rev speed when crossing the start/finish line is 5500 RPM. 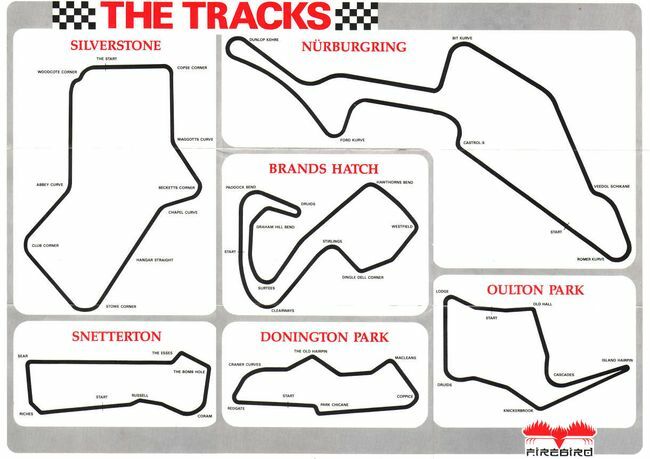 H.T.W: "A top class Formel 3 simulation with Snetterton, Silverstone, Brands Hatch, Donington Park, Quilton Park and Nürburgring. 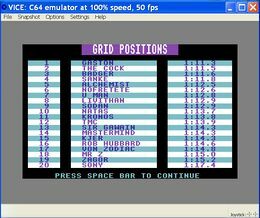 This racing simulation was programmed by grand old master Geoffrey J. Crammond, who also wrote the following F1-Grand-Prix series on the PC. The possibility of up to 20 players taking part and one player driving while the other 19 are simulated on the basis of their training performance, is unique. 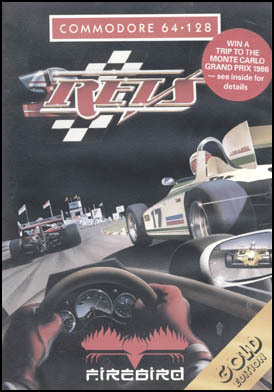 This game has real 3D graphics and the feeling was and is just great when the car skidds and jumps. However, for a beginner it is almost frustratingly difficult to drive a round without crashes. But with some training, if you can drive in the throng, you will not get away from the computer much. 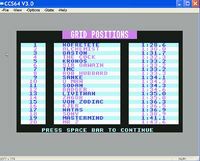 Therefore: This programme is a milestone in the world of car racing simulations!!" This page was last modified on 14 July 2018, at 23:50.